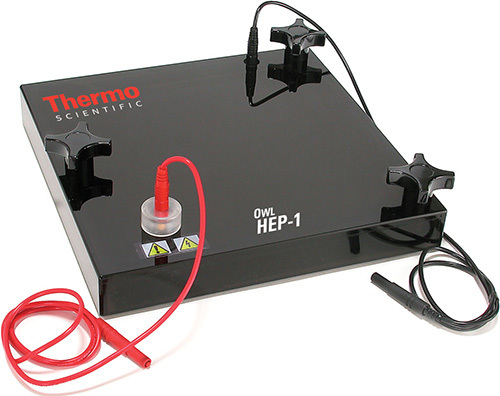 The Owl HEP-1 Semi Dry Electroblotting system has a sleek, low profile for fast, efficient transfer of proteins and nucleic acids to membranes. The Owl HEP-1 system requires minimal amounts of buffer. The buffer contained within the blotting filter paper is sufficient for efficient transfer of molecules. Ships complete with Base with Stainless Steel Cathode Plate, Lid with Platinum/Titanium Anode Plate, Power Supply Leads, Heavy Duty Knobs. The base contains a stainless steel cathode plate and the lid contains a platinum/titanium anode plate. Part Number FP-1. Owl's blotting paper provides sufficient thickness to absorb adequate amounts of buffer for semi dry electroblotting without the loss of mechanical stability. High purity, 100% cotton fiber blotting paper is ideal for wicking and blotting applications. Papers are available in pre cut mini gel and large format gel sizes and compatible with Owl electroblotting systems. Part Number FP-2. Owl's blotting paper provides sufficient thickness to absorb adequate amounts of buffer for semi dry electroblotting without the loss of mechanical stability. High purity, 100% cotton fiber blotting paper is ideal for wicking and blotting applications. Papers are available in pre cut mini gel and large format gel sizes and compatible with Owl electroblotting systems. Part Number FP-3. Owl's blotting paper provides sufficient thickness to absorb adequate amounts of buffer for semi dry electroblotting without the loss of mechanical stability. High purity, 100% cotton fiber blotting paper is ideal for wicking and blotting applications. Papers are available in pre cut mini gel and large format gel sizes and compatible with Owl electroblotting systems. Part Number FP-4. Owl's blotting paper provides sufficient thickness to absorb adequate amounts of buffer for semi dry electroblotting without the loss of mechanical stability. High purity, 100% cotton fiber blotting paper is ideal for wicking and blotting applications. Papers are available in pre cut mini gel and large format gel sizes and compatible with Owl electroblotting systems. Part Number FP-6. Owl's blotting paper provides sufficient thickness to absorb adequate amounts of buffer for semi dry electroblotting without the loss of mechanical stability. High purity, 100% cotton fiber blotting paper is ideal for wicking and blotting applications. Papers are available in pre cut mini gel and large format gel sizes and compatible with Owl electroblotting systems. Part Number FP-7. Owl's blotting paper provides sufficient thickness to absorb adequate amounts of buffer for semi dry electroblotting without the loss of mechanical stability. High purity, 100% cotton fiber blotting paper is ideal for wicking and blotting applications. Papers are available in pre cut mini gel and large format gel sizes and compatible with Owl electroblotting systems.